Our review is based on the German edition by Abacus Spiele, the original English edition is from Rio Grande Games. Long long ago, in a galaxy far, far away, five civilisations are about to leave their cosmic cradle and go forth into the galaxy. We’re only interested in four of them here, because, frankly, the fifth one is made up entirely of oddballs and no one wants to play with them. 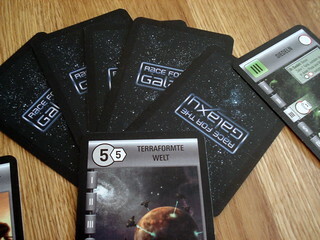 Also, Race for the Galaxy is for up to four players, so one starting civilisation has to sit out each game. The other ones start with their home planet on the table and two fistful of cards in the hand of their superior galactic leader/elected president/emperor/benevolent electronic ruler. The first fistful of cards is your civilisation’s potential achievements: worlds to colonize and developments to make. All those cards look very inviting, but only a few of those you see will ever make it to the table. Choose wisely. The second set of cards is the same for all players: the seven action cards. Race for the Galaxy works like this: each round has five phases and each of the seven action cards is associated with one phase (phases I and IV get two cards each, why will become clear in a moment). At the start of each round, all players simultaneously select one of their action cards and the phases that at least one player has selected a card for will happen for all players. For instance, if one player plays an action card for phase I (exploration) then all players get to do the explore action. The player(s) who played the card for that phase, however, get some extra bonus that varies from action to action. The phases are always performed in the same order, not in player order: you always explore, then develop, settle, consume and produce. Each action taken by itself is very simple. In the explore phase, you draw two new civilisation cards, keep one of them and discard the other. The bonuses for picking this action yourself are either drawing keeping one more card – to bolster your hand – or drawing five more but still only keeping one – to find specific cards. This second option will go completely unused in the first two or three games. Don’t worry, that’s normal. Once all the players have an idea what cards exist, scouting for the right ones becomes much more popular. Phase II is the develop phase: you may place one development card from your hand on the table, but you have to pay its price: discard from one to six hand cards, depending on the card you want to play. I told you that most of those shiny cards would never hit the table. My usual opening hand consists only of cards I really want to play, and all but one I’ll never see again. The bonus for picking develop as your action makes it slightly more bearable: all prices are reduced by one. Settle – phase III – is similar to develop in most cases, only you play colony cards instead of developments. Some have the price in big, aggressive red numbers instead of plain, soothing black. These colonies have a prior owner that is less than happy about vacating the premise: you need military power, provided by some colony and development cards, to conquer these worlds. But you don’t have to discard cards, that’s a plus well worth considering. The bonus here is that you draw a card after settling. The last two actions are in a less than convenient order: consume and produce. That’s not only illogical, it’s also very bad for the flow of the explanation, so I’ll go with phase V first. Some of your colonies have their price tag with a bold blue, green brown or yellow background. Those are your production worlds. When production happens, all those worlds produce one of their respective goods by placing a card from the draw pile face down on top of that world. The four types of goods are luxury articles, genes – that’s DNA, not blue cotton pants – rare elements and alien technology. If you yourself chose the produce action you may also produce on one windfall world; on windfall worlds production is less stable for whatever reason, so they only produce goods every once in a while. Every planet can only hold one goods card at a time, so before you produce again you want to consume them, elegantly leading us to phase IV. I told you the flow of the explanation would be better this way. To consume goods, you need to have cards with a consume ability on the table. Most of those let you discard one goods card in return for drawing new cards or gaining victory points – because victory points are what it’s all about, we don’t really care if citizens of our galactic empire can eat or pursue their happiness. Some consume abilities are a bit more tricky, for example you may have to discard three different types of goods, but also for a better payoff. Consume is also more tricky than the other actions because it’s mandatory: you have to consume as long as you have goods and unused abilities. That may not sound to bad – after all, we all want victory points – but if you have to consume because another player picked that action, and you don’t yet have all the goods you need for your really awesome abilities… . Consume has two action cards associated with it again: one doubles all victory points you gain from consuming, the other lets you trade one goods card for two to five hand cards, depending on the type of goods. That all sounds interesting, but not very deep yet. The one detail to change this perception: cards can not only have consume abilities, but abilities associated with all phases. They might let you draw or keep more cards when exploring, cut prices when settling or developing, let you draw extra cards as an addition to virtually any action and more. These special actions are where you win or lose the game: play cards that synergize well and your empire will grow to the edges of the galaxy, chose poorly and be forgotten. 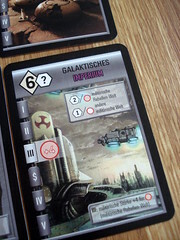 The edges of the galaxy, by the way, are not as far away as they sound: you can reach them with only twelve cards, because the game ends when the first player gets there. Especially important for building synergies are the most expensive developments, costing a steep six cards. 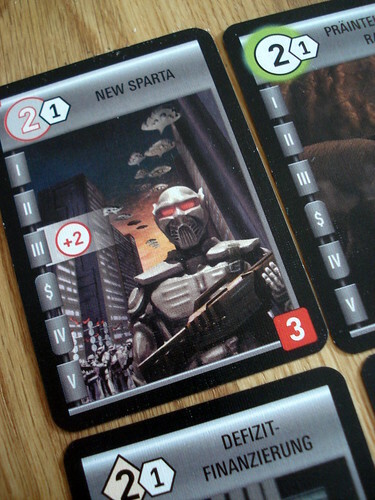 Each of these developments has a powerful ability to score extra points at the end of the game, for cards of the right color, cards with military strength, cards consume abilities. You name it, there is probably a card that gives you points for it. The cards and their abilities have split the opinion of the boardgaming world like very few components before. 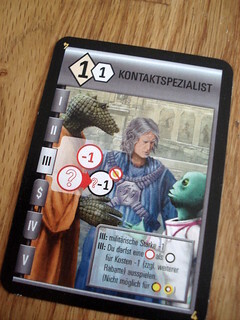 All abilities are expressed as icon on the card, and while some people say these icons are the most effective way to put information on the card ever others consider them slightly above finger painting performed by a drunk monkey for their information value. I’m on the fence about that issue but tending towards the former view. We had to consult the player aids many times in the beginning to figure out what a particular card does, but once you get into the game the icons do an excellent job refreshing your memory. They certainly don’t ruin the game like I saw some people claim, but no one can tell me with a straight face that they looked at the Contact Specialist and immediately understood what he does, either. Anyway, it would take more to ruin Race for the Galaxy: it’s a brilliant, quick game that keeps everyone engaged at all times. It rewards strategic play and offers many routes to victory. I didn’t believe that last part myself at first – surely expensive development cards mentioned earlier with their extra scoring rules are so powerful that you need them to win. I was soon taught differently when another player obliterated my shining empire by having the more efficient produce/consume cycle and gaining points through that. Then, when I tried that, I was soundly defeated again by someone else rushing the game along and finishing before I got my game going. He didn’t have many points, but still more than everyone else. And this is not the learning process of a new player, all those strategies can work, depending on the situation, your opponents and how well you can use the actions they chose – never forget the powers of parasitism when building your empire. And, of course, victory depends on your luck. Despite all strategy, Race for the Galaxy is still a card game and if you keep drawing the wrong cards there’s little you can do. I really enjoy Race for the Galaxy, it certainly deserves its spot as one of Rio Grande Games’ flagship products next to Dominion. The first cycle of expansions – The Gathering Storm, Rebel vs. Imperium and The Brink of War – concluded in 2010. I haven’t tried any of those expansions, I just know they were very popular, but even designer Thomas Lehmann has acknowledged some minor issues with them: cards in the later sets tended to be more powerful than earlier ones and some were even stronger variants of cards from the base game, making the original superfluous. The intent of that series of expansions was to tell a continuous story of your growing empire, so thematically these things made perfect sense. From a gameplay point of view, however, they were problematic. With the coming reboot of the series, starting with Alien Artifacts scheduled for this year still, those problems will be addressed. Alien Artifacts will also build upon the base game only, not on the first cycle of expansions, so if you wanted to give Race for the Galaxy a try but were put off by the three scary expansions that were already available, now is the perfect time. And may the non-trademarked equivalent of the Force be with you. This is the game you will never find on Google. Because the name of the game is The Game, and that’s just not very distinctive. The Game is a cooperative card game that was nominated for the 2015 Spiel des Jahres. It’s small and abstract, but that doesn’t say anything about how much fun it is. Abstract strategy games for two players. There are many of them already, you could think that all the good ideas have been done. And then a game like Coerceo comes along, completely redefines how you use the board in a classic black-vs-white abstract game and is all fresh and exciting. You should never consider a genre complete, there are always great ideas still to be dicovered. Legacy games, games where every time you play you make permanent changes to the game, are the big, new thing. Ever since I heard about Risk Legacy, the founder of the genre, I’ve been thinking what other games would work with the addition of Legacy mechanics, and Pandemic was at the top of that list. Now there is Pandemic Legacy, and we all finally get to find out if I was right. A train robbery can really ruin your day if you’re one of the passengers. Six bandits trying to rob your train at the same time, but working against each other? With a Marshal thrown in ot fend them off? That’s actually pretty hilarious to watch. And on the gorgeous 3D train of Colt Express, it’s even more fun. All of the chaos, in three dimensions. Naples, the birthplace of pizza, is being invaded. Local businesses selling pizza are under attack by a foreign product: French Fries. Papà Paolo, the master pizzaiolo, is obviously offended by foreign food trying to take over his city. Up to four up-and-coming pizza bakers compete to become the great baker’s successor in Papà Paolo. They don’t actually beat back invading fried potatoes, but they will build their own, little pizza empire. And in the end, that’s what really counts, right? In an age of boardgames made of cardboard, some games stand out for their material. But a real wood cube as game “board” is not the only thing Master Thieves has to offer: you will also find a good amount of strategy and the greatest challenge to your memory and sense of direction I know about in any recent game. It’s not easy being a god. Unless you already established monotheism, then it’s all easy sailing. But to get there, some hard work will be necessary. Summoning tornados and tsunamis, ensuring a good harvest for your people and fighting the eternal danger of atheism, it’s all in a days work for a god.